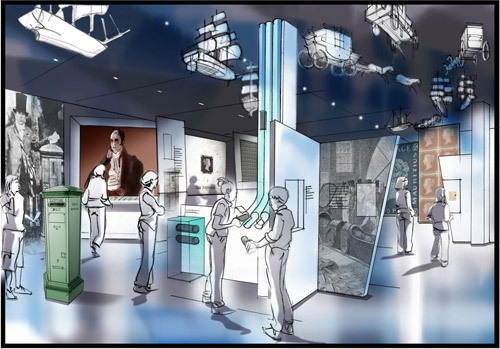 Emily Llewellyn, a Year 12 student at Langley Academy and member of their Museum Council explains how she used a story from the BPMA collection in a student-led exhibition. 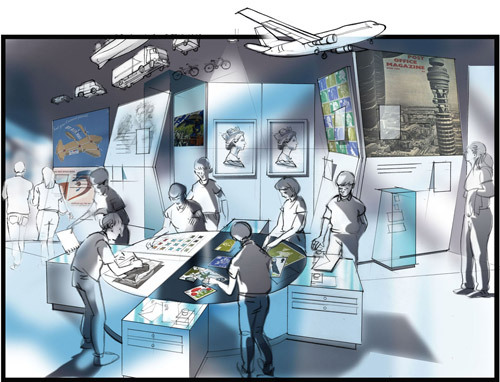 My school, The Langley Academy in Slough, which is the UK’s first school with a focus in Museum Learning, recently curated an exhibition called Campaign! as part of our Museum Learning term. 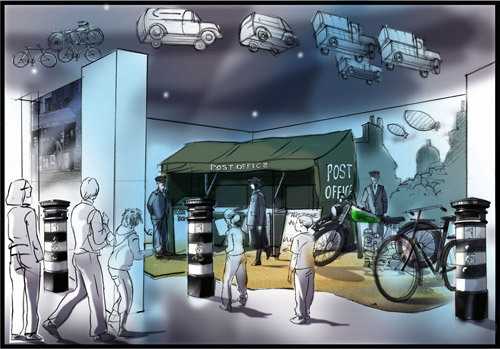 The British Postal Museum were kind enough to allow us to include some of their images in the exhibition. This included a photograph on display in the Suffragette case. The photograph shows two women who became known as “human letters” after they posted themselves to Downing Street in an attempt to personally deliver a message to the Prime Minister. The photo on display alongside an umbrella belonging to Nancy Astor, the first female MP who also lived locally to Slough. The exhibition was curated by the Museum Team and Year 12 Creative writing students. The exhibition covered multiple popular campaigns throughout history including Suffragettes, the Magna Carta, Child Rights, Human Rights, LGBTQ Rights and Slavery. Read more about the Suffragette human letters. This week there have been a number of commemorations and memorial events marking the 100th anniversary of the death of Emily Wilding Davison, the suffrage campaigner who famously ran on to the course at the Epsom Downs Derby and was knocked down by the King’s horse. While Davison’s was one of the most extreme acts of protest in the campaign for votes for women, other lesser-known stunts are just as noteworthy. 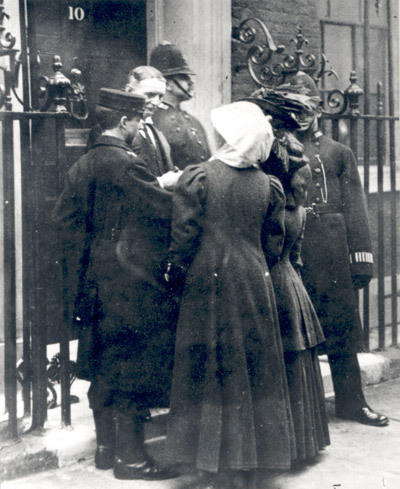 A.S. Palmer delivers Miss Solomon and Miss McLellan to 10 Downing Street, 23rd February 1909. 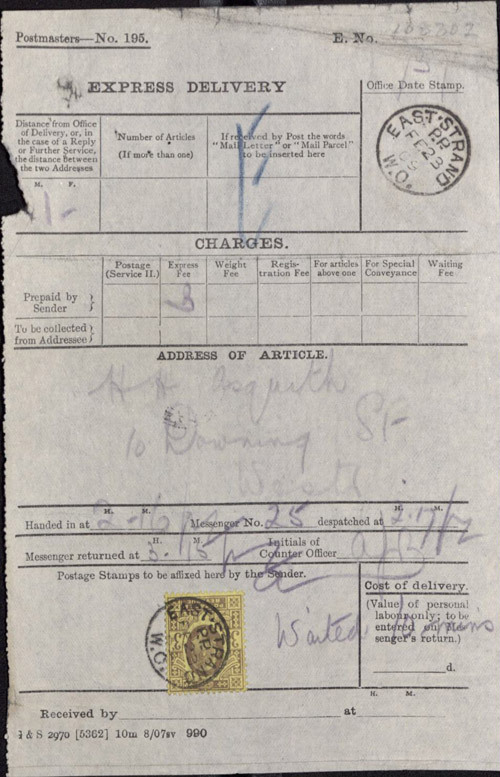 The Royal Mail Archive holds a file on this event (POST 30/1655a), which includes a Post Office Express Service form showing that the suffragettes were charged 3d and that the recipient did not sign for the “letters” delivered by A.S. Palmer. This fascinating and little-known story of women’s suffrage was the subject of a podcast featuring Dr Katherine Rake. Listen and download BPMA Podcast #3 – Human Letters for free from BPMA Podcast, iTunes or Soundcloud. See large scans of the documents mentioned in this blog in our Flickr set Human Letters. Last week I took the chance to visit some of our London 2010: Festival of Stamps partner exhibitions and displays. 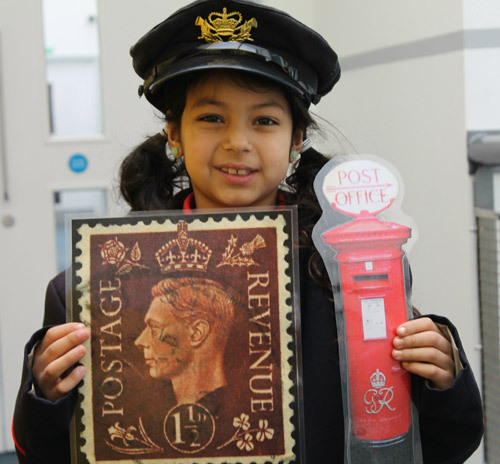 It was a chance to meet the different people involved, and see the many different stories that stamps can tell. My first stop was Room 69a at the British Museum, to see Impressions of Africa: Money, Medals and Stamps. The exhibition shows how money and stamps have been used as symbols of power, vision, freedom and pride in the fight for independence in Africa. Although sophisticated systems using items such as salt, cloth and beads had existed for thousands of years, coins and stamps were produced in Africa by European colonial powers as a way of asserting their authority. Following from that, many of the items on display (a number of which are on loan from the BPMA) show how African countries have since used imagery to construct their own national identities. Images of national heroes, industry and the peaceful coexistence of diverse groups have been used to evoke unity and strength. My next visit was to the Women’s Library to see Fe:MAIL, Suffragettes and the Post. Cut out stamp card made using second hand postage stamps. This fascinating display examines how the suffragettes used the post to further their campaign for the vote, often going to extreme and violent lengths. The postal service played a crucial role in the suffragette campaign as it was a tool for mass communication and propaganda. 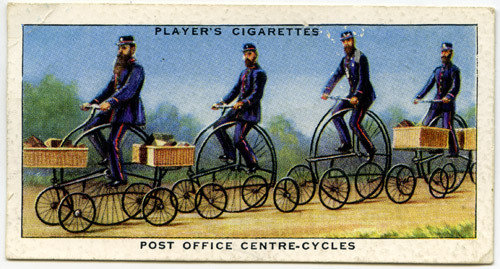 Postcards helped to make the public aware of the movement, and helped to bring pressure on Parliament through public opinion. The women used images on postcards to portray themselves as citizens who not only deserved the vote on moral and democratic grounds, but who would also use their vote carefully and objectively. 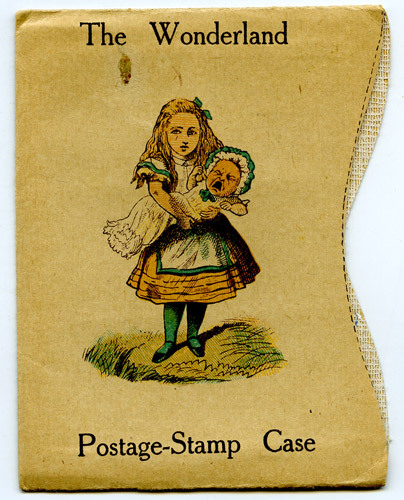 The stamp below is known as a Cinderella stamp. 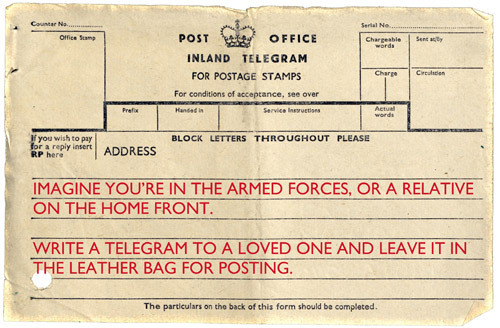 It has no postal validity, but was usually placed on an envelope alongside official stamps. 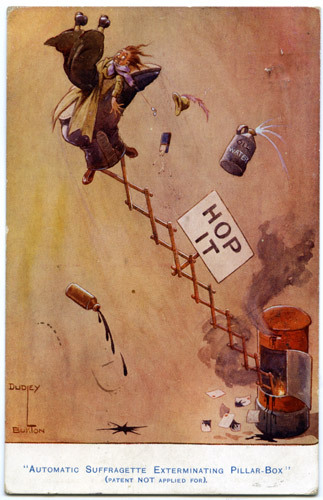 This example was published for the 1915 woman’s suffrage amendment campaign in Washington. My last visit of the day was to Twickenham World Rugby Museum to see the display of rugby related letters, postcards, telegrams and stamps from their collection. The display offers an interesting glimpse into how both rugby and correspondence have changed through the years, and includes a telegram to the RFU President from his French counterpart congratulating him on England’s win in 1953. The full programme of events for London 2010: Festival of Stamps can be found at http://www.london2010.org.uk/. From pepper in the letters to postcard propaganda, the history of suffragettes has more sticky situations than a book of stamps. The new foyer display at The Women’s Library, Fe:MAIL, Suffragettes and the Post, explores how suffragettes saw the Post Office as both a means of mass communication and a symbol of the oppressive male Government; as friend and simultaneously foe. During the campaign to win women the vote, militant and moderate suffragettes alike used and attacked the postal system to increase the momentum of their campaign and to ensure frequent media coverage. And with over 32,500 pillar boxes in place by 1900, the scope for direct action was almost without limits. 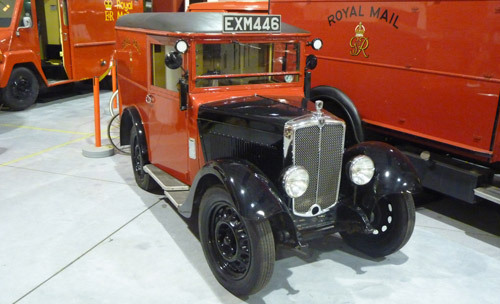 Members of the WSPU, including the Pankhursts, smashed post office windows, poured acid in pillar boxes, set fire to post boxes and put pepper in letters addressed to anti-suffrage MPs. The suffragettes Daisy Solomon and Elspeth McClellan even posted themselves to Prime Minister Asquith, with demands for the vote written across them like human letters. 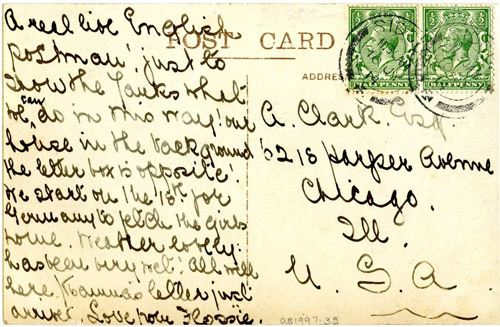 Fe:MAIL, Suffragettes and the Post includes a fascinating selection of postcards, stamps and audio accounts from those who took part in some of the most daring postal dramas as well as the world’s first suffrage stamp, the prison diary of a suffragette charged with smashing post office windows, newspaper cuttings and the world’s earliest known suffrage postcard. Fe:MAIL, Suffragettes and the Post is at The Women’s Library, London Metropolitan University, Old Castle Street, London E1 7NT until October. For further details please see the Women’s Library website. Norman Watson, postal historian and co-curator of Fe:MAIL, Suffragettes and the Post, explores one of the most extraordinary episodes in the history of the post: how the suffrage movement exploited the mail service. 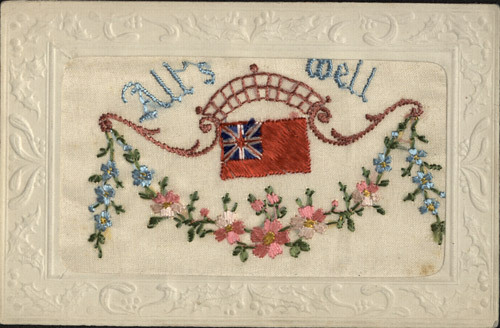 Using postcards, letters and photographs he examines the insightful and sometimes curious ways in which Edwardian campaigners embraced this new mass communication system. For further information on this event please see the Women’s Library website.